Nightmares are a common nighttime occurrence in adults and children. Nightmares are often of an upsetting nature and can be disruptive if they occur beyond the occasional occurrence. Learning what causes nightmares may help you to feel better about them, or at least to make some changes so you can avoid them. What is behind these dreams? The cause of dreams can be a variety of things, no matter if they are good dreams or bad. There is not one definitive reason behind the occurrence of any form of dream, but researchers feel that some things can indeed contribute to nightmares. Eating a meal just before going to bed can cause the brain to have an intense amount of energy. The brain is more active and this in itself leads to more dreams, sometimes nightmares. Some people who live with sleep disorders, especially narcolepsy, are more prone to experiencing nightmares more often than those that do not. 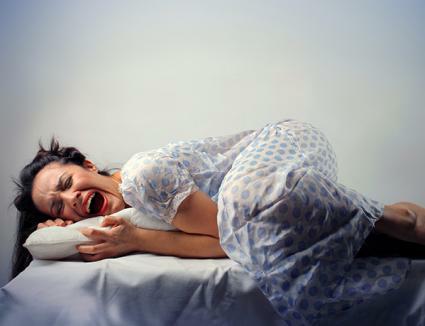 Those suffering from sleep apnea may also experience nightmares more often. Some medications, such as narcotics and antidepressants, have been linked to nightmares. Nightmares may be caused by an allergy to the medication, as a side effect or even from withdrawal from the drug (both prescription and illegal drugs). Alcohol and alcohol withdrawal can lead to nightmares. Some illnesses can cause high fevers, which can lead to nightmares and more intense dreams. There are several emotional conditions that are known to cause nightmares. Psychological issues: Certain psychological issues are associated with higher incidences of nightmares and recurring nightmares, such as post-traumatic stress disorder, depression, schizophrenia, and dissociative disorders are all associated with higher incidences of nightmares. Anxiety and Stress: Going to sleep worrying can bring on nightmares. The hormones released during periods of anxiety and stress can lead to nightmares during sleep. Major Life Changes: Death, divorce, financial problems and other highly stressful life events can lead to nightmares in some individuals. This happens because dreams in general often have a direct relation to day-to-day life, even when they are not nightmares specifically. Living in the Gray Area: Certain individuals with blurred personal boundaries, when tested with personality tests, are more prone to nightmares. This is thought to occur because of their highly developed imaginations. These people often view themselves as living in the gray area of life, rather than seeing life as "black and white." Nightmares and night terrors are two very different types of nighttime experiences. One of the largest differences in them is they happen at different stages of sleep. Nightmares happen during REM sleep. Night terrors happen during slow wave sleep. Also, nightmares and night terrors differ in what the person does during the incident. When a person experiences a nightmare, they might get frightened and scream, but they are also easily awakened and remember details about the dream. A person experiencing night terrors might seem half awake, but will not be responsive to anyone trying to awaken them. Night terrors may also prompt screaming and thrashing around in bed. Also, the sleeper has no memory of the night terror incident. Nightmares can scare you. Nightmares are very similar to any other dream; they just have a negative or frightening theme to them. Still, they can be powerful enough to disturb sleep long term, especially if they are reoccurring. In many cases, bad dreams are spontaneous, temporary and require no intervention. However, if you are losing sleep on a regular basis, if the nightmares are causing distress or if the dreaming interferes with your ability to function, discuss the problem with your physician. Your doctor may recommend a sleep expert if you are experiencing frequent nightmares.